Giving back to our community is a significant aspect of our club focus. Over the years our club has made financial or equipment donations to Dominican Hospital, CLIMB (Center for Loss in Multiple Birth), Lucile Packard Children’s Hospital, Sutter Maternity & Surgery Center, HAND of the Peninsula, Family and Children’s Services of Santa Cruz County, and others. 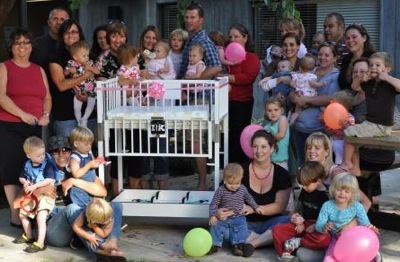 In 2010, The Santa Cruz Mothers of Twins Club (now Santa Cruz Parents of Multiples) donated a neonatal cribette to Dominican Hospital’s Level 3 Neonatal Intensive Care Unit. This special bed sleeps two to promote the unique health needs of premature multiples who may need special care in the NICU. Co-bedding (twins or other multiples sleeping together) strengthens the bond that is formed in the womb. Read more about the donation in the Santa Cruz Sentinel.